​Hometown: Somerville, New Jersey, U.S.
Died: August 22, 2009 in Operation Enduring Freedom. 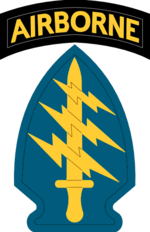 Unit: 2nd Battalion, 7th Special Forces Group (Airborne), Fort Bragg, N.C.
Staff Sgt Andrew Lobosco of Somerville, New Jersey lived in Bridgewater and graduated in 1998 from Immaculata High School in Somerville. He attended Raritan Valley Community College and received his Associate's Degree. He joined the Army in 2003 and was assigned to the 2nd Battalion, 7th Special Forces Group (Airborne) at Fort Bragg. 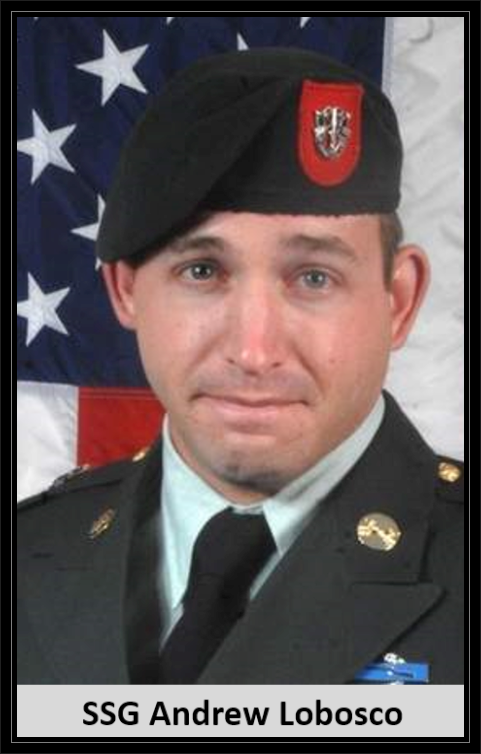 He earned the distinction of being a Green Beret in January 2007. He is survived by his mother, Bonnie Kostiuk Lobosco, his twin sister, Lisa and his extended family. His father, Robert Lobosco and his grandfather, Joseph M. Kostiuk have both since passed. Andrew died at age 29 in Yakhchal, Afghanistan, of wounds suffered when enemy forces attacked his unit. Staff Sergeant Andrew T. Lobosco, 29, was killed August 22, 2009, while conducting a dismounted patrol in the vicinity of Yakhchal, Afghanistan, in support of combat operations while serving with Company C, 2nd Battalion, 7th Special Forces Group (Airborne). Lobosco’s military education includes the Warrior Leader’s Course, Basic NCO Course, Survival, Evasion, Resistance and Escape Course, Basic Airborne Course, and Special Forces Qualification Course. His awards and decorations include the Bronze Star Medal, Purple Heart Medal, Army Good Conduct Medal, National Defense Service Medal, Global War on Terrorism Service Medal, non-commissioned officer professional development ribbon, Army Service Ribbon, NATO Medal, Combat Infantryman Badge, Parachutist Badge, and the Special Forces Tab. Andrew was my older brother. By 3 minutes. I’m pretty sure Andrew planned to be the firstborn, if only to make sure it was safe for me to come out. Ever since that day, I found myself following his lead. If I wasn’t quite convinced by the time Andy joined the Army to become a Green Beret, I was definitely giving him credit when he completed what is arguably the hardest academic MOS: 18 Delta (Special Forces Medical. I saw my brother go from an overactive kid who had a tendency to harass my friends and me if he was bored, to a man who would go out of his way to say something positive to you or recognize your accomplishments, no matter how small. Andy became known for gathering lost sheep to offer friendship and support to, and making sure to include everyone. As a Green Beret, he taught friends and family the meaning of De Oppresso Liber, and more importantly, he exemplified it. The last time I spent with my brother was over the Independence Day holiday in 2009. Just days before he would leave for his second deployment to Afghanistan and just weeks before he would be killed in combat, the Lord blessed us with this last chance to make powerful memories. Two of those I will share. The first is how, during a celebration on July 4th, Andrew gathered all of us around the bonfire and taught us how to properly retire the U.S. flag. Among other things, it was an important reminder that the freedoms of this nation, so worth preserving, are still subject to decay without our vigilance. It also spoke to the mutual respect that is required to keep both this government and its citizens in balance. The flag does not just represent the government, it represents the people as well. The second memory is from later that same evening. Walking back over to the fire, I overheard the end of a conversation. I don’t know what the question had been, but I heard Andrew’s reply that he would be glad to die for his country and that he hoped to have the honor of a battlefield death. The example Andrew sets for all of us is enormous. I ask you who are reading this to uphold the honor and integrity of Andrew’s legacy. Logically think through what you believe in and then stand by it. Fight for principle and virtue. Fight for the oppressed. And trust in God’s sovereign justice. Robert and Bonnie Lobosco admire the newly installed plaque at the footbridge between Somerville and Bridgewater named in honor of their son, Army Staff Sargent Andrew T. Lobosco, killed in Afghanistan last year. 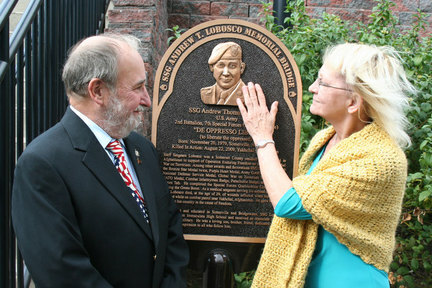 BRIDGEWATER – The parents of Army Staff Sargent Andrew T. Lobosco, who was killed in action in Afghanistan in August 2009, joined local officials to view recently installed plaques dedicated to their son’s memory. The two bronze plaques are located at either end of the SSgt. Andrew T. Lobosco Memorial Bridge, a pedestrian bridge linking Somerville near Immaculata High School with the Bridgewater Commons Mall across Route 22. The footbridge was dedicated to his memory during a ceremony held in February; however, the plaques were not ready at that time and were installed later. Robert and Bonnie Lobosco joined members of the Somerset County Board of Freeholders, State Sen. Kip Bateman, Bridgewater Councilman Dan Hayes, and Immaculata High School student Steven Wright at the bridge on Sept. 9, which coincidentally was the one-year anniversary of SSgt. Lobosco’s funeral at Arlington National Cemetery. The Loboscos also wished to visit the plaques for the first time near Sept. 11, a date that was so important to their son and his military unit. SSgt. Lobosco’s memory also has been honored by Task Force 111-B of the 5th Special Forces Group serving overseas. The clinic at the unit’s Fire Base Davis in Qalat, Afghanistan, has been named the Lobosco Aid Station. “It is a small token of our profound appreciation and honor of the ultimate sacrifice made by SSG Lobosco in service to his country and a small gesture of our feelings of brotherhood with our 7th Special Forces Group comrades and the medics who serve within its ranks,” the Task Force members wrote. SSgt. Lobosco was a medic with the 7th Special Forces Group in Afghanistan at the time of his death. Sen. Bateman spearheaded the bridge naming; Councilman Hayes helped organize the February dedication ceremony. The Freeholders – Director Jack M. Ciattarelli, Deputy Director Robert Zaborowski, Peter S. Palmer, Patricia L. Walsh and Patrick Scaglione – hosted the event at the county-owned pedestrian bridge. Steven Wright originally proposed the bridge-naming idea, since SSgt. Lobosco had graduated from Immaculata. Mr. Lobosco lives in Bridgewater; Mrs. Lobosco resides in Easton, Pa.